Horace Julian Bond, a foot soldier, a civil rights leader, and a man who embodied the term #BlackLivesMatter. He was one of the youngest founding members of the Student Nonviolent Coordinating Committee (SNCC), and he founded the Southern Poverty Law Center. He was elected Board Chairman of the NAACP in 1998. He served in the Georgia House of Representatives from 1965 to 1975, and in the Georgia Senate from 1975 to 1986. He was also the voice that narrated the PBS documentary that chronicled the history of the Civil Rights Movement, “Eyes on The Prize”. 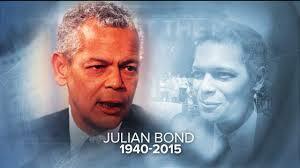 At his decease, Julian Bond was 75 years old. America, we have lost a great leader! In an April, 2015 interview at Brandeis University, Mr. Bond talked about voter suppression, his disdain for how Lyndon Johnson was depicted in the movie Selma and he talked about the Republican-led hostility against President Barack Obama. Mr. Julian Bond will be buried at sea in a private ceremony. Rest in peace and power, Mr. Bond! This entry was posted in Barack Obama, Black History, Civil Rights, Julian Bond, NAACP, SNCC, Voter Suppression and tagged Civil Rights Movement, Julian Bond, NAACP, Obama, SNCC, Voter Suppression on August 18, 2015 by speakingthosethings. We Don’t Deserve Mr. Obama! The United States of America does not deserve President Barack Hussein Obama. Other nations have said as much, and I am here to lend my amen. President Barack Obama ran on an idealistic platform of hope and change. Those disillusioned by the current reality should take a look in the mirror. We the people have failed this president . We have not been the change that this country needed. We have allowed old racist mentalities to prevail. A mentality that essentially fears any black person that does not cower or any black person that demonstrates above average intelligence. The racist code words of today are “uppity” and “professorial” each attributed to Mr. Obama. The latter just means that he is smarter than most and that his intelligence is resented by the privileged and the ignorant alike. In 2009, Barack Obama came into office with a vision of hope and change for America, but Americans have persisted with racist attitudes that summarily have dashed hopes, and limited the first black president’s ability to bring about the change that is so desperately needed in our country. We are not post-racial, we are racist, sexist, violent and greedy! In 2010 and now in 2014, those who did vote made sure that they checked the power of the first black man in the White House. Democrats didn’t turn out the vote in 2010, and they ran away from the President in 2014. Democrats lost big in both mid-term elections, but even more so in 2014 relinquishing power to the Republicans in both houses of Congress. Losing the Senate presents a major challenge to governing in the last two years of the Obama Administration. Mr. Obama came to power at one of the worst points in US history and he had to hit the ground running. Indeed, Cush has been running hard and well since 2009. Under the eight years of Bush, we were subjected to terrorist attacks, two wars, mounting deficits and an economic crash. Isn’t it curious that the United States of America was willing to elect the first black president when it seemed that the country was going off the cliff. Now that Mr. Obama has accomplished so much and brought the country back from the brink — passed Obamacare, brought soldiers home from two wars, saved the US economy that has now created jobs for 52 consecutive months, reduced the deficit, bailed out the auto industry, brought down the unemployment rate and, yes, I’ll give him credit for low gas prices too, it seems Democrats and definitely Republicans are all too eager to move on to 2016. It is perplexing that Democrats could not find one thing to run on as it pertains to Mr. Obama’s record during the 2014 mid-terms. Eric Holder is right, Americans are cowards when it comes down to confronting issues of race. The 2014 red state, mid-term elections brought out the profound cowardice and liberal race bias in Democrats. They would not dare run on the black president’s record in red America because these red Americans digest Fox news like a meth addict. These southern and plains states Americans, also known as the “real America” by the likes of Sarah Palin, have wholeheartedly embraced Lee Atwater’s Southern Strategy. Then there’s the Cromnibus bill, also known as the continuing resolution omnibus spending bill which was vigorously debated in Congress prior to its passage in both the House and the Senate. Democrats were up in arms, and rightly so, because of the proposed repeal of Dodd-Frank that was drafted by Citigroup and snuck into the bill at the last minute. But, don’t be mad at Obama or blame the president when he lobbies for the bill to pass. You did not vote. When you don’t vote, the wrong Party gets in power. Elections matter. So now, it’s pass this undesirable bill to keep the government open, or wait six months for the Republicans, when they control both houses of Congress, to draft and even uglier, more draconian bill. 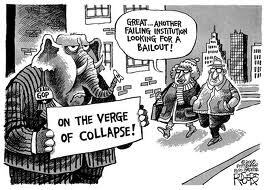 Vote next time so you can repeal the repeal of Dodd-Frank. There are some good things in the bill like funding for Obamacare and early childhood education. These days, I have had to repeatedly curb my enthusiasm online out of concern that I may cross that invisible, but oh-so-real line into vitriolic speech. But I’ll tell you emphatically what I hate, the hypocrisy of the United States to impose it’s version of democracy on other nations while denying it here at home. Voting rights under attack — stripped, obstructed or manipulated to ensure that black and brown people are further marginalized and deterred from voting. News of black lives taken by Klan-like police officers and vigilante citizenry who shoot first. You know who I’m talking about — Mike Brown, Eric Garner and Trayvon Martin. I am at a place where I prefer to not self-identify as the politically correct term, African American, but rather as a “black” person, and a member of the black nation worldwide. Lest we forget, there are more people of color in this world than not. Besides, my true identity was stripped with that of my ancestors upon import to the United States. I am equally disgusted with a political system that has pimped Barack Obama while it was lucrative to advance political careers, That’s you Democrats! By the way DCCC and DSCC, don’t call me any more for donations until you grow a spine and acknowledge the accomplishments of the black man, namely Barack Obama. Once Obama’s approval ratings took a downward turn after six years of governing, which is what Presidents must do, Democrats forgot the black guy’s name. As for Republicans, Barack Obama has been good business for you hatemongers too — you’ve sold plenty of “I hate Obama” books and beefed up ratings on TV and radio with your racist, vitriolic hate speech that stokes irrational fear of black people in most of rural America. GOP propaganda and hate speech has a strong and enduring market in the United States. Today’s reality of the first black president of the United States is a wake up call for black people to the persistent racism of America. Some black people had been lulled into a false sense of equality, but now in the era of Obama, the stark reality of race bias has hit some squarely between the eyes and permeated their consciousness. Black America has experienced a cautionary tale — stay alert because civil rights gains of the past are not necessarily guaranteed today or tomorrow. Those who thought that it was enough to only vote in the general election were sadly mistaken. Black turnout in both 2010 and 2014 mid-term elections has been disappointing. What’s more concerning is many have yet to understand the impact of not participating in our democracy. Silence translates to consent. As we approach these last two years of the Obama presidency, pundits like Michael Eric Dyson are now showing their true selves with strong indictments against the president regarding his response to the killings of Mike Brown and Eric Garner. As a point of fact, Mr. Obama’s Department of Justice is investigating both killings. Mr. Obama has already convened a task force to address the issue of black young men being killed by police departments in alarming numbers. So, I have a particular bone to pick with Mr. Dyson. As a black intellectual Mr. Dyson is now firmly in the Tavis Smiley-Cornell West camp. Jealousy is unattractive, and if he is so intelligent, why cannot he, of all people, understand that a black leader must govern with shrewdness and wisdom in this country. Besides, Mr. Obama represents all Americans and not just black Americans. For context, read my piece under Salient Points entitled, “Governing While Black”. Then there is New York Senator Chuck Schumer, who confessed recently that Democrats made a mistake by passing healthcare reform. This career Democrat Senator is less interested in the healthcare of Americans than he is in re-election. Mr. Obama’s care and willingness to do hard things while in office has scared Democrats. Democracy for America Communications Director, T. Neil Sroka commented that anyone who thought health care reform “was the wrong way to earn the support of middle-class, working families needs to have their head examined.” Yes, many are jumping ship now; weary of six years of a black president in a racist country. I wouldn’t count the President out just yet though. He can still frustrate Republicans by Executive Order, and he has the power to veto their legislation. This entry was posted in Obama, Politics, Race and tagged 2014 Midterms, ACA, Barack Obama, BlackLivesMatter, Cromnibus, Dodd Frank, Elizabeth Warren, Eric Garner, Mike Brown, Obamacare, Southern Strategy, Voter Suppression on December 14, 2014 by speakingthosethings. 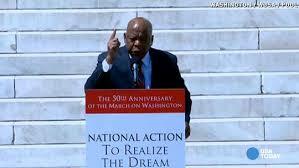 Today in Washington, DC we commemorated, celebrated and marched on the 50th Anniversary of the March on Washington. The report is that tens of thousands of people were in attendance . NAACP, Labor, Gay, Straight, Black, White, Hispanic, Asian, young and old alike were in attendance and marching to say, “we shall not be moved”. This is what the right-wing racist is terrified about. This is why they obstruct President Obama and subvert the federal government. But I say, where there is unity, there is power, and the people are uniting to march and stand against injustice — racial profiling, stand your ground, stop and risk, income inequality and the list goes on. This is why we must march on, organize and fight the injustice of racism, classism and any other “ism” that seeks to divide and conquer Americans. I was pleased to see so many different ethnic groups and cultures coming together to embrace the ideals of the Civil Rights Movement and the legacy of Dr. Martin Luther King. Just like Barack Obama, the legacy of Dr. Martin Luther King has galvanized all kinds of people from many walks of life. Many speakers brought words of exhortation and challenge today. I encourage each of you to find your passion and put your heart and soul into it. I am increasingly burdened by the vicious attacks on voting rights in America as well as the injustice system that continues to incarcerate so many African-Americans. We are 13% of the population yet 44% of the prison population. I will be using this space to focus on those two key issues. It is utterly appalling and disingenuous to speak of liberty and freedom yet work to subvert and undermine Democracy when the outcome of an election is not to one’s liking. This is essentially what the Republican Party is doing. Because the Republican Party is pissed that a black man is President of the United States, they seek to delegitimize him. This modern Republican Party is nothing more than former Dixiecrats who were, in recent history, blatant white supremacist bigots who sought to stop black people from voting and receiving basic civil and even human rights. Well, the Supreme Court under the corrupt leadership of John Roberts, has found a way to undermine the Voting Rights Act (VRA) by striking down Section 4. I refuse to salute JR as a Justice. He is a racist and works to revive, establish and underpin Jim Crow law. Since the attack on the VRA by the Supreme Court, several southern states, with great haste, are pushing legislation to make it harder for people to vote and aiming these obstacles squarely at black and brown, young and old specifically. All that they do to hinder will backfire because the people are not deceived by these malicious GOP tactics. We will do what we must to register to vote and to acquire official government identification. All that they are doing will simply piss us off so that we will turn out to vote in not only the general, Presidential elections, but in mid-term elections and in primaries. Declare your Party, register to vote, acquire your government sanctioned ID. Help someone to do the same or help pay for them to get their identification. The haters will not win. This entry was posted in Politics, Race and tagged GOP, March on Washington, Racism, Supreme Court, Voter Suppression, Voting Rights Act on August 25, 2013 by speakingthosethings. WASHINGTON (Reuters) – The Supreme Court on Wednesday [02.27.2013] will consider whether to strike down a key provision of a federal law designed to protect minority voters. During the one-hour oral argument, the nine justices will hear the claim made by officials from Shelby County, Alabama, that Section 5 of the Voting Rights Act is no longer needed. The key issue is whether Congress has the authority under the 15th Amendment, which gave African Americans the right to vote, to require some states, mainly in the South, to show that any proposed election-law change would not discriminate against minority voters. Conservative activists and local officials in some jurisdictions covered by the provision have long complained about it, saying that it is an unacceptable infringement on state sovereignty. Hans von Spakovsky, a senior legal fellow with the conservative Heritage Foundation who formerly worked in the Justice Department’s civil rights division, said that the “terrible history” that warranted Section 5’s intrusion on state authority was over. 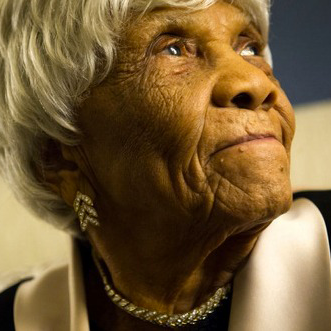 So let’s ask Ms. Desilene Victor a 102 year old Florida voter if that “terrible history” is over. It took Ms. Desilene six hours to vote during the 2012 Presidential Election. A bill has been introduced by Florida State Senator Oscar Braynon. Senator Braynon’s bill–SB 888 or Desiline’s Free and Fair Democracy Act–hopes to “modernize the state’s voting system and enshrine the right to vote into state law,” according to an Advancement Project press release. This entry was posted in Voting Rights and tagged 15th Amendment, Supreme Court, Voter Suppression, Voting Rights Act on February 27, 2013 by speakingthosethings. Sam Tanenhaus writes a compelling article in The New Republic about the inevitable decline of the GOP if it remains the party of just white people, which is its current trend. The GOP not only needs to change its messengers, it needs to change its message. The Republican Party of the present day is certainly not the party of Lincoln, but, more apparently, the party of John C. Calhoun. Conservatism has become the code word for bigotry with many Republicans channeling Jim Crow Dixiecrats. I’m happy to say that the Southern Strategy is exposed and failing. …the GOP is in jeopardy, the gravest since 1964, of ceasing to be a national party. The article offers a great history lesson of conservatism and the GOP in America. During the 20th century, liberalism is equated to communism. Sound familiar? But Tanenhaus details that John C. Calhoun, pro-slavery politician and author of “nullification” (also known as state’s rights) influenced countless conservatives for more than a century, including William F. Buckley, Jim Crow proponent and the founder of National Review magazine, Barry Goldwater and the GOP icon, Ronald Reagan. The politics of “nullification” is nothing new yet it is veiled in the rhetoric and claims of “big government”. It is simply the desire of some conservatives, to no longer be a part of our democratic collective. Tax avoidance is the ploy used to “starve the beast” or make sure that certain groups or factions that are deemed undesirable by the extreme right-wing do not benefit from taxpayer dollars. We hear the echoes of nullification in the venting of anti-government passions and also in campaigns to “starve government,” curtail voter registration, repeal legislation, delegitimize presidents. There is a strong sectionalist bias in these efforts. As Tanenhaus asserts, the GOP strategy is a losing strategy stuck in a bygone era of white supremacy. The country has changed both philosophically and demographically, but I surmise the GOP will be the last to acknowledge that fact. This entry was posted in Politics, Race and tagged Conservatism, GOP, Politics, Racial Attitudes, Racism, Republican, Voter Suppression on February 20, 2013 by speakingthosethings. Will the Supreme Court Dismantle the Voting Rights Act? The Fifteenth Amendment assigns Congress — not the Supreme Court — the responsibility of ensuring that no citizens are denied their right to vote. Section 5 has faced at least two constitutional challenges in the past, and survived both of them. This entry was posted in Congress, Politics, Race, Voter Suppression, Voting Rights Act and tagged Congress, Race, Supreme Court, Voter Suppression, Voting Rights Act on January 2, 2013 by speakingthosethings.